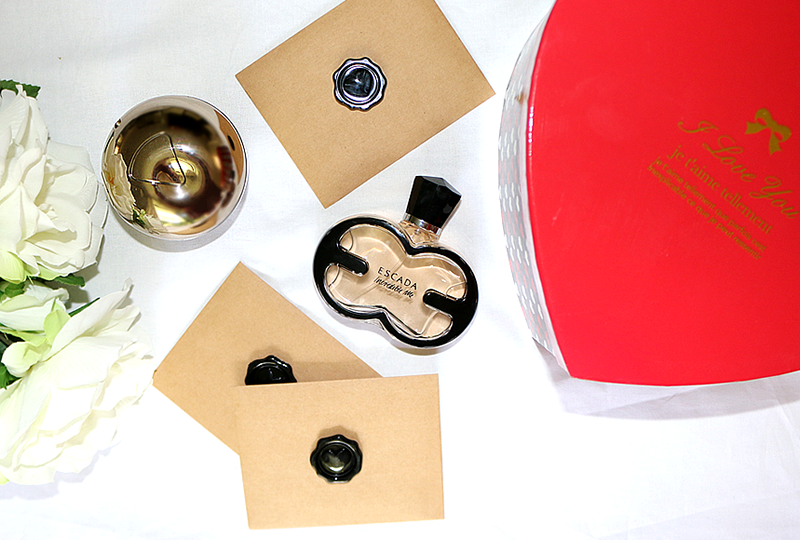 Love is in the air and so too is the smell of amazing perfumes. In this post I'm sharing with you two scents that I love; one great for day time and another perfect for night. For a day time scent we have DKNY Golden Delicious because it is the perfect fresh and fruity fragrance. It keeps it fresh and light so it is perfect for day time but it does have dark undertones so you could potentially transition this to night. This fragrance has top notes of apple, orange blossom and plum so already you can tell that this is a very fruity scent. This scent has middle notes of rose, orchid and lily, adding a floral element to the perfume. With a very slight undertone of wood, sandalwood and musk. Other recommendations include; Marc Jacobs Daisy, DKNY Be Delicious and Marc Jacobs Honey. A more night appropriate perfume is Escada Incredible Me and the reason being that it has quite dark undertones. It's sultry and romantic so perfect for a nice dinner date out with your partner. This fragrance features high notes of vanilla, sandalwood and orchid with undertones of honeysuckle, tiramisu (coffee cake) and clementine. Other recommendations include; Chanel No.5, YSL Black Opium and Victor&Rolf Flowerbomb.